As one of the few consistently successful companies over the last decade, LEGO has been the talk of the business world for a while. Mother business model has been closely studied and their product itself is so prominent and popular, the brand itself is the default term for toy building blogs (much like Coke is with soda and Band-aids are with adhesive bandages). As such, it’s no surprise that the toy giant Hasbro would seek to get in on that. Initially, there were Transformers-licensed LEGO sets. But Hasbro set their sights higher and decided to create their own building block line. For some reason. Bruticus is the combined form of a team of five four Decepticons known as the Combaticons. Rough, ruthless, and generally so violent, they make other Decepticons uncomfortable, the Combaticons are generally seen as the worse there are. Sadly, while the individual units may be dynamically gifted, Bruticus is dumber than a bag of hammers, leaving him with just his (admittedly tremendous) brute force. In the Gen-One continuity, Bruticus (and the Combaticons in general) were the result of Starscream’s tinkering. Later incarnations of the story usually maintain some at least tertiary connection between them, but the Combaticons have largely come out from beneath the Big Mouth One’s shadow. While the little LEGO Kreo figures look more like Kreo figures than their Transformers counterparts, they definitely have enough traits in common to be able to identify Swindle as Swindle and Vortex as Vortex. 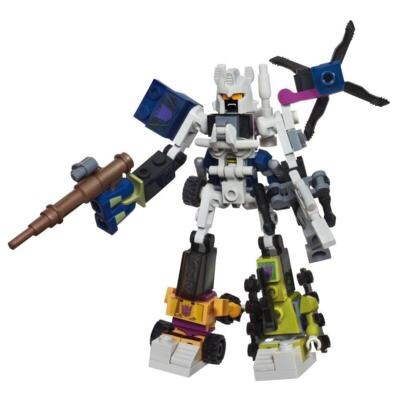 Never the less, they still look generic enough to be more Kreo versions of said characters than actually said characters. The figures themselves are unremarkable. They’re sturdy enough, but are lacking slightly behind LEGO’s famous durability. The pieces are quite small, limiting just how tough the plastic can be. And since the figures are deliberately designed to come apart, there is little overall stability. It is a little frustrating that the figures do not, in any meaningful way, transform. Each figure must be almost entirely disassembled and reassembled to go from vehicle to robot and back. The process of forming Bruticus is, likewise, less an act of combining the individual units so much as completely disintegrating them and building Bruticus from scratch. While it’s true that neither Transformers nor LEGO have the greatest reputation when it comes to mobility in their figures, these figures really seem unambitious. Wheels don’t move when it seems like they could very easily while joints seem like they could be a little more dynamic. This is challenging to score because there are definitely lots of little extras with these figures. Too many, and most of them are pieces needed for the other form. Wheels in vehicle mode have to be summarily removed and left aside in robot mode. Each character comes with a weapon but only one, leaving dual-wielding for Vortex to leave Onslaught without a weapon. Hasbro’s excellence in packaging continues. The box is distinctive, showing both the individual figures and the combined form. It also pushes the other Kreo combiners. It also gives the impression that this isn’t one toy you’re getting but a set of four individuals, which really helps for a convincing sale. This is a really weak idea. LEGO Transformers I could definitely get behind, but not when it’s siding so much more on the LEGO side of things than the Transformers side. It feels more like a LEGO action figure expansion pack or something, not anything truly vehicle-related. The transformation sequence, such as it is, feels very phoned-in with how much ‘okay, now take it all apart’ each process entails. All in all, this just seems like a cheap knockoff. Sadly, of both LEGO and Transformers. This Friday, the first episode of my newest serial – and also my oldest serial – goes live. After the prelude which was New Phase, I will be releasing the new and improved Teach The Sky serial (which was my first serial, originally published in 2002). To help with some branding matters, it has been rechristened ‘Knights’. It will go live this Friday and will begin updating twice a month, on the first and third Friday. I’m also waiting to announce some articles I’ve written for a few other websites, as well as the release of the print edition of Rhest for the Wicked. Once Rhest is in print, my publisher and I will be able to push forward on the next novel project, Samifel. Last week, I finally got around to watching the first episode the new Sailor Moon reboot, Sailor Moon Crystal. It’s good, but I’d be lying if I said I wasn’t a little underwhelmed. I thought about reviewing it for last week’s Tools of the Imagination, but thought better of it, deciding to wait for the whole season at least to finish up. I considered instead reviewing some Sailor Moon toys. ToI really is supposed to be about toys, with movies and shows (theoretically) being tertiary. Having played with some of the Sailor Moon toys when the original show aired on the 1990s, I kind of liked the idea. I’ve reviewed almost exclusively ‘boys’ toys on here and Sailor Moon was and still is one of those great franchises at tries to break down that rather arbitrary wall. The problem was finding information on the toys themselves. Boys’ toys (and I don’t like using that designation, but it is kind of industry standard and it seems appropriate for this particular discussion about one of many inequities in the toy market so I’m going to run with it) are pretty thoroughly documented. You can get every tiny little detail on just about every toy made for boys. But girls’ toys? Outside of Barbie, good luck. Picture can be found but release dates, measurements, distribution information? You have to really know where to look, and verifying with multiple official sources is a dream. Part of this I understand. Boys’ toys are geared very much on the idea of collecting. Get all the Autobots. Have all the Cobra vehicles. I’d say it’s a feature of action figures, but the Sailor Moon toys were and are action figures and there’s really no evidence of such an effort for these to be collected. They certainly haven’t seen the usual monitoring and cataloging that their boys’ toys counterparts have seen. Part of this may be fandom, part of this may be industry. It’s hard to tell. Do toys not sell well because the kids aren’t interested, or are kids not interested because the toys aren’t marketed well, or are toys not marketed well because they don’t sell well? That question alone is at the heart of economics and debated by industry professionals to this day. But while they debate it, little girls who want to play with women action figures find themselves short on options. And little boys who want a little boy doll to play house with are just as out of luck. I’ve talked previously about the original animated version of the Hobbit. An exceptionally good film, it is not the only pre-Jacksonian attempt to bring Tolkein’s works to life. Underground animation superstar Ralph Bakshi would take a crack at the heart of the saga with The Lord of the Rings. But whereas Rankin & Bass took steps to make sure the Hobbit (and its follow-up, the Return of the King) remained family-friendly, Bakshi had no such interests. It’s during this time that Terrytunes director Ralph Bakshi would produce a string of underground and alternative animated films, geared at adults. His first work, Fritz the Cat, a film adaptation of the infamous underground comic, would be the first animated movie to receive an X-rating by the MPAA. Bakshi would follow it up with equally controversial films. In 1977, Bakshi would venture into fantasy with Wizards. That success would galvanize him to take on the holy trilogy of fantasy, The Lord of the Rings. Bringing with him his experience using rotoscope (filming in live action, then tracing over the images on animation cels), he would end up producing one of the most ambitious fantasy films, and animated films, to date. 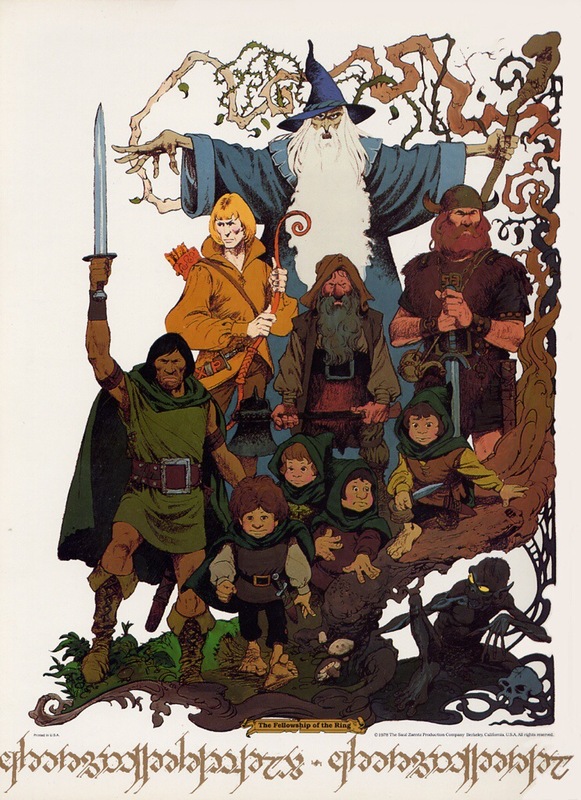 Much like Rankin & Bass did with their adaptation of the Hobbit, and Peter Jackson would do with the live-action movies two decades later, Bakshi sticks pretty close to the original narrative, deviating only a little (see Bombadil, Tom). In fact, in many ways, Bakshi’s movie is even closer to the original books than the Jackson Trilogy. A few scenes are rushed here and there, but the vast majority of the Fellowship and the Two Towers is vividly displayed. The earthen tones of this movie, and its subdued color palette, may be a little off-putting at first glance, but they are actually in keeping with the descriptions in the books. Likewise, the characters are drawn very expressively, managing to capture a level of realism seldom seen in animation. It’s hard to put into words what rotoscope art is like. It really must be seen to be appreciated. Very few types of animation ever compare to the smoothness of movement and the little nuances of a live-action performance, but rotoscope does just that. The subtly of life is truly depicted in every facial expression and every physical move. Where the movie does fall a little flat is in the characterization. Much of the wealth of character information just isn’t present. There’s little if any explanation for who or what Gandalf is (aside from a wizard, despite him never casting any spells). The same is true for Frodo, Aragorn, and the rest. Very little is done to explain the motivations of the characters or for them to experience any real growth over the course of the story. Much like the animation, the dialogue is noticeably richer than any other animated work of this time. The lines are far smoother and natural, giving the voice actors some real freedom with which to perform. And it shows. John Hurt, especially, delivers a fantastic performance as Aragorn. He’s far more human and personable than Viggo Mortenson’s portrayal in the live-action films. Likewise, the stellar portrayal of Legalos will really shock fans when they realize it’s Anthony ‘C3-PO’ Daniels. Lord of the Rings fans need to watch this movie, as do animation fans in general. It’s really great to see a very different, yet still very loyal, take on the source material. Little things like the more-accurate depiction of the Balrog, Galadriel’s reaction to Frodo offering her the ring, and other differences are as charming to see as the similarities like Boromir’s equally badass death or the truly unsettling first-encounter with the ring wraith. This is a movie of rare distinction and worth seeing. So, Garth Brooks is coming out of pseudo-retirement. In and of itself, that’s kind of cool. Garth Brooks is one of the biggest names in country music, and music in general. For him to walk away from success at the height of his career so that he could focus on raising his family is quite an admirably story. That he is finally returning to professional music after so many years away is likewise admirable. He faces a lot of challenges and pressures and the sheer of act of going back on tour must be daunting to say the least. Personally, I’ve never been that big of a fan of Brooks’ music. I like a few of his songs but most of his discography just doesn’t speak to me (I’ve just never really been a country fan). That said, Brooks’ career as an artist has definitely fascinated me. His 1997 free concert in New York City was a landmark performance in the eyes of many people. While I have no doubt he got some (likely considerable) money from the event, that it was still free to anyone and everyone is remarkable beyond words. Likewise, rumors of Brooks’ charity and generosity abound. Such behavior is rare for major headlining stars. What makes Brooks stand out to me as an artist, however, is one of his biggest failures. In 1999, Brooks endeavored to launch a totally independent musical career under the pseudonym ‘Chris Gaines’. A fictional Australian alternative rocker, Gaines’ music was supposed to be a radical departure from Brooks’ usual catalog. It was a chance for him to tackle a totally new genre of music, at least theoretically free from the expectations and requirements of his primary career. The Chris Gaines albums are pretty mediocre. They’re not awful, which in some ways would make them better. If they were truly terrible, the. There might be some irony factor, some so-bad-it’s-good elements. But the truth is that it’s just meh. Why it’s remarkable is because of how daring an experiment it was. You can count on one hand the number of times a major headlining act has shifted genres or tried to perform in a totally new manner. The Beatles’ Sgt. Pepper album or Neil Young’s Trans or Everybody’s Rockin‘ are a few of the rare examples. The most iconic band in history and one of the most successful and beloved musical performers of all time. Rare air, that. Garth Brooks created an alternative persona, complete with backstory and unique musical style. He committed fully to exploring this new genre of music and trying to develop the voice of Chris Gaines. It failed, falling flat when the music proved to be unremarkable and audiences kept wanting to see Garth Brooks instead. The persona was retired pretty quickly. Musically (and commercially) it was a failure, but artistically, it was an amazing and bold experiment. Artists of all genres, in all mediums, could stand to take a risk like that, to step out of our comfort zones and attempt to find a totally new voice and style. The Chris Gaines’ Experiment is not something that should be forgotten, but something that should be lauded. And Garth Brooks should be remembered, among so many other accolades, for taking a daring and unprecedented artistic risk. So here’s to hoping this new chapter in his career will see similar artistic bravery.